The majority of the video games data I’ve found is historic, with a couple of one-off, short-term forecasts for mobile phone gamers by Statista (2011-2020), and another one-off forecast for 2008-2018 for daily time spent gaming by VSS. I’ve also seen a couple five-year industry revenues forecasts from Euromonitor and Pricewaterhouse Coopers (to 2019), but these figures are pretty well protected behind paywalls. 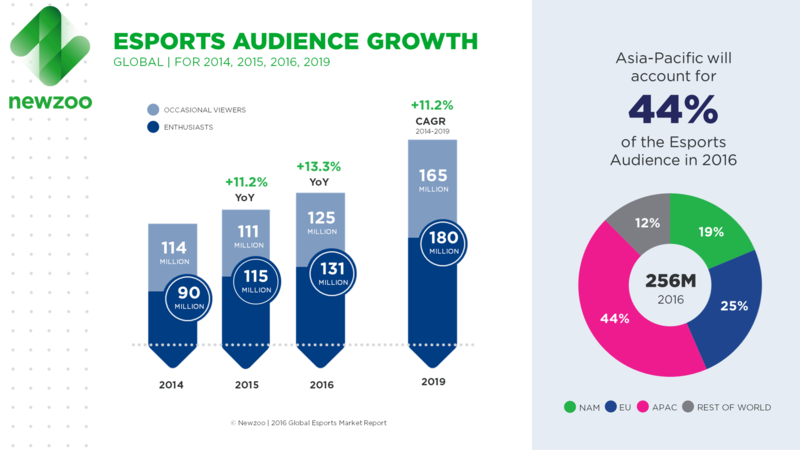 NewZoo also forecasts audience and revenues for eSports to 2019, and they’re pretty open with their data, but these figures are global. Releases per year historic data is available for 1971-2015 from Moby Games. I also found one Quora estimate for titles released 2003-2012, but this is a very rough approximate showing a trend that does not strictly agree with the Moby Games data. The ESA publishes an annual “Essential Facts” report, which has recently included numeric estimates of the number of game players (2014). Older reports give percentages only. The indicators describing number of players have varied a bit from year to year, but some approximation is available for 2004 through the present. In addition to the ESA report, GameTrack has also issued a numeric estimate of the number of players, but just for 2012. A few historic estimates of time spent gaming are available for 2011-2013 from Neilsen; 2008-2018 and 1995-2005 from VSS; 2014 from NPD Group; and 1999-2009 from the Kaiser Family Foundation. I’ve found one website that provides fairly comprehensive eSports earnings information going back to 1998, including total prize money, tournaments, active players, US players, US earnings, etc. A 2010 article describing the “death of the video game expert” as a result of the explosion in the number of games published per year refers to video game database MobyGames.com as its source for annual game release numbers. The article includes a chart through 2009, but doesn’t give the tallies for each year, so I’ve retrieved the information from MobyGames. The simple tally for 1971-2015 is in this Google Sheet. Note: This database includes substantially more titles than were reflected in the Quora answer below (in which data was gathered by hand from a variety of Wikipedia pages). I believe the MobyGames data to be more accurate. Dana Laratta. April 8, 2010. “The Death of the Video Game Expert.” BitMob. via Internet Archive. A Quora researcher compiled data from various Wikipedia pages and found that in general there has been a decline in the number of releases per year from 2003 through 2012. Several commenters have theories on why this may be or corroborate the trend. Src: David Cole. October 31, 2013. 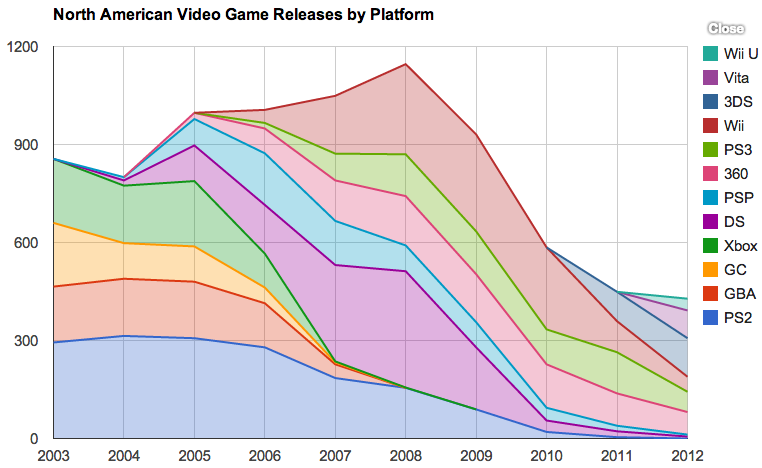 “On average, how many video games are released each year, by platform?” Quora. Since 1975 (through 2010), 547 films have given rise to around 2,000 video games, and film adaptations are now (2010) a category that accounts for some 10% of video games published. NOTE: IMAGE LINKS ARE BROKEN, BUT IMAGES ARE AVAILABLE HERE. GameTrack, via: Rachel Weber. Dec 11, 2012. “US Still the Gaming Super Power.” GamesIndustry.biz. 42% of Americans play video games regularly (3 hours or more per week). Note: I believe the 2005 report (with data for 2004) was the first year the ESA started quantifying the number of players/playing households. The 2004 report (with data for 2003) does not include any such figures. src: Krista Lofgren. February 8, 2016. “2016 Video Game Statistics & Trends Who’s Playing What & Why.” Big Fish Games. Note: Big Fish Games produces and distributes casual games. These figures were not cited in the blog post in which they were given, but the author confirms by email that the data came from a Statista study on the Digital Market Outlook for video games. src: Veronis Suhler Stevenson & Borrell Assoicates (VSS), 2014, via Emmanuel Agu, et al. “Making Exergames Appealing” in “Handbook on Holistic Perspectives in Gamification for Clinical Pactice,” 2015. NOTE: I suspect this report is referring to VSS data, although they’re not cited. These “core gamers” make up 12% of the total survey respondents (extrapolated to 34 million individuals ages 9+). This is down two percent from 14% of respondents in 2013. Among the total surveyed population, 42% (extrapolated to 118 million individuals ages 9+) play on a core device. 19% (extrapoalted to 53 million) play 5+ hours per week on a core device. “Core gamer”: individuals who play video games five or more hours per week on a PlayStation3, PlayStation 4, Xbox One, PC, or Mac, and who play Action, Adventure, Fighting, Flight, Massively Multi-Player, Racing, Real Time Strategy, Role-Plating, Shooter, or Sport genres on any of those devices. Includes industry stats 2009-2014, five year forecast from 2014-2019 (“Video games is expected to see a CAGR of 4% at constant 2014 prices over the forecast period.” Early growth will be driven by console purchases, thereafter by software sales.) Fee-based report – no other figures freely accessible. Annaul global entertainment and media outlook (Outlook), covers 13 entertainment and media segments, including video games. The Outlook provides a five-year foreast and five-year historic consumer and advertiser spending data and analysis. US video game industry (console and PC games, browser-based games, apps, digital and physical, game advertising) will grow 30% from $15 billion in 2014 to $19.6 billion in 2019, with a mature compound annual growth rate of 5.5% Traditional console and PC games were about 80.8% of game industry revenue in 2014, and expected to drop a fraction to 79% by 2019. These figures DO NOT include hardware sales of gaming PCs, consoles, or other devices. Physical PC game sales are projected to decline, but digital games will grow with a CAGR of 6.8% (from $501M to $696M. Online PC games are expected to grow from $2.53B to $3.66B, a CAGR of 7.6%. Beyond traditional games, social/casual gaming revenue will grow at a CAGR of 4.5%, reflecting a switch from browser-based to app-based revenue. Overall, the social/casual segment of gaming will be 12% of the total revenue in 2019. Video game ad revenue is forecast to grow at a CAGR of 11.1%. Game ad revenues are stronger in the US than any other market because of the fragmented media landscape in the US, high digital video recorder ownership (which makes it easy to skip TV ads), high social network engagement, and low newspaper readership, all of which drives advertisers to seek out consumers in places like gaming. 71.5 million people watched competitive gaming in 2013. Note: In the following poll, esports viewership makes up a small percentage of overall gaming video content, which includes trailers, reviews, walkthroughs, etc. Poll respondents had viewed gaming-related video content at least once in the past year. Note: Not sure if “non-participants” are gamers who haven’t played competitively in eSports matches, or gamers who don’t watch esports. About half of eSports viewers spend 1-4 hours per week watching esports. 20% watches for less than 1 hour per week, 20% watches 5-9 hours. Last year (2014) the World Championship finals for a fantasy-strategy game called League of Legends drew 45,000 spectators to the Seoul World Cup Stadium to watch 16 teams from South Korea and China battle it out for a $2.13 million prize pool, with a further 27 million people watching online. MLGtv attracts 27 million viewers a month, drawing its revenue largely from mainstream consumer advertisers – fast-food chains, grooming products, car manufacturers. Sepso puts the company’s value “in the hundreds of millions” of dollars. The top-earning CoD player is 22-year-old Matt Haag, who plays for Team Optic under the name NaDeSHoT. Three years ago Haag was flipping burgers in McDonald’s. He now has 1.6 million subscribers to his YouTube channel, 1.1 million followers on Twitter, and reportedly earns close to $1 million a year. With a basic salary, and money made from weekly online tournaments, players can make $30,273 – $45,409 a year. The real money lies in sponsorship and the advertising revenue to be made from building up a fan-base by streaming on YouTube or Twitch. NewZoo is a video game and esports research firm. Below are excerpts from both their 2016 and 2015 reports. The 2015 report makes some interesting scale comparisons to traditional sports. In terms of audience, the report shows that the number of esports Enthusiasts will jump from 89 million last year (2014) to 145 million in 2017. Another 190 million will watch esports competitions occasionally, showing that competitive gaming has evolved to a spectator sport with a fan base comparable to that of Volleyball, American Football or Ice Hockey. In terms of fans, there are 2.2 billion people globally who consider themselves to be interested or very interested in sports and of these, 1.6 billion actively participate in at least one sport. This is comparable to the 1.7 billion people that play games. On a global scale, the number of esports enthusiasts compares well to mid-tier traditional sports. Swimming and ice hockey for example have 76 million and 94 million global fans respectively, similar to the 89 million esports enthusiasts. By 2017, the global number of esports fans will come close to that of American football. On a global scale, there are 2.2 billion sports fans who each generate an average of $56 per year. The average revenue for individual sports is anywhere from $20 upwards. Esports enthusiasts on the other hand, currently generate an average of $2.2 per person per year, without game revenues taken into account. Our current esports revenue projections use a conservative $3.2 average revenue per enthusiast figure for 2017. 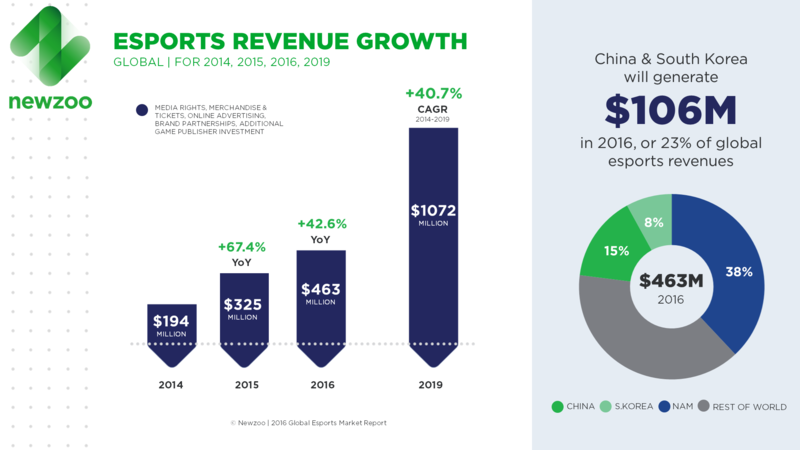 With growth mainly driven by a larger audience, global esports revenues will still rise to $451 million in two years from now. This renders esports comparable to a top 10 sport or globally renowned leagues like the NFL or Champions League. 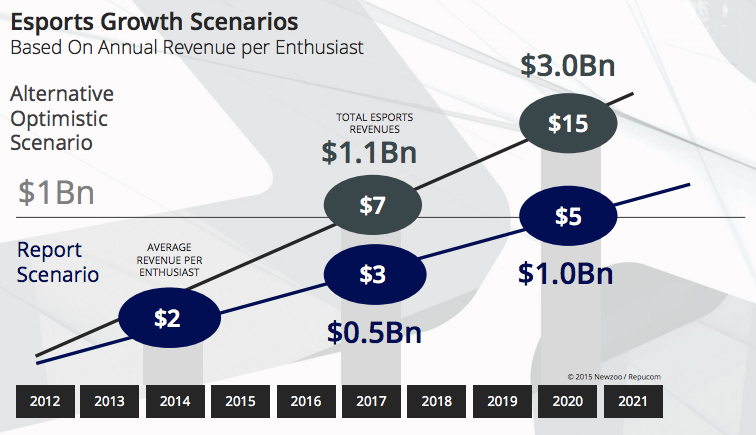 If the average revenue per enthusiast grows faster and jumps to $7, esports will be a billion dollar business by 2017 with even more growth potential going forward. 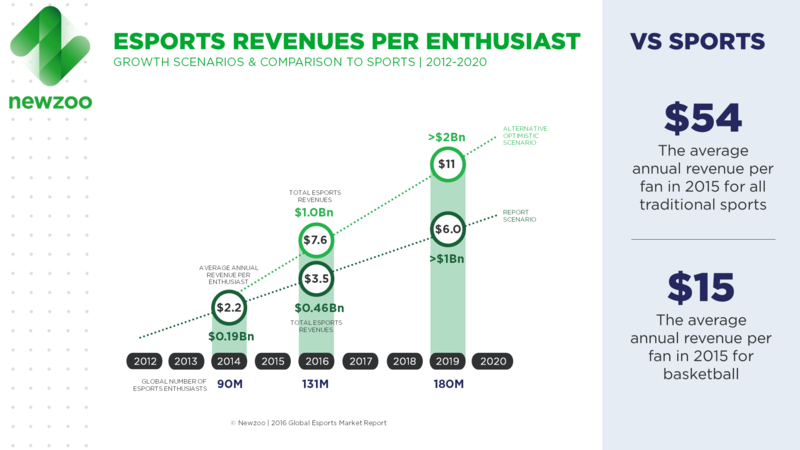 Drawing from the comparison with traditional sports, the report highlights which factors will determine the pace of growth of the esports Economy. esportsearnings.com tracks prize earnings, and player, team, and country rankings. Historic data goes back to 1998. Information is sourced from the community, but there is a strict requirement for data to be cited. I cross-referenced a few of the figures against data reported by Redbull’s esports reporting, and the figures were very close. Data is collected in the following Google Doc. This database has been cited in reporting by The Verge.